Jinxter Revived uses the interface that was introduced with The Pawn and since then steadily improved. But we have more! 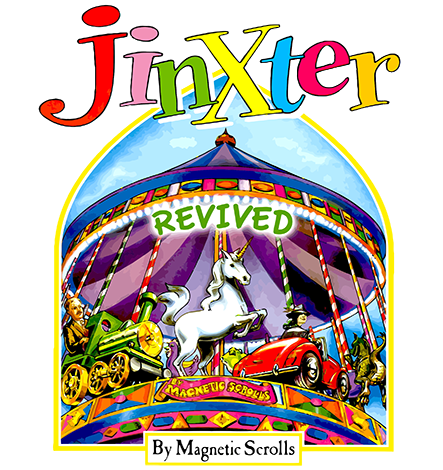 Jinxter got additional pictures, a replacement for the not so nice bus picture at game start and a bunch of new pictures. Plus we added ambient sounds. But as usual the most changes have been applied under the hood. We worked hard to make the game more enjoyable. Many of the dead ends got ruled out, some logical problems got resolved, and we made it easier to stay in the flow of the game. And we fixed some things that really annoyed a lot of people in the original version. None of this is mandatory for you, though. You can choose to play Jinxter in the very old-skool typing way without all the enhancements …or… you play the typing way with all the enhancements …or… you play with all the new, good stuff and use our touch/click interface saving you from puzzling over the right commands or simply from typing on devices that are not well suited. We hope you will enjoy the remastered game! The game is available for Andoid in the Play Store, for iOS in the App Store, and for Windows,Linux, and macOS on itch.